After shattering nearly every box office record known to man, the blockbuster sequel Star Wars: The Force Awakens is finally coming to Blu-ray and DVD in just two weeks. 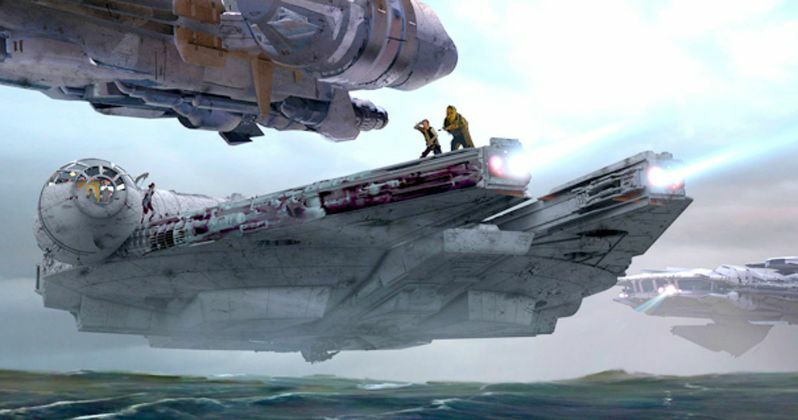 To celebrate the movie's impending home arrival, Disney and Lucasfilm have shared official concept art, giving us a look at how this long-awaited sequel transformed throughout pre-production. There are some surprises along the way, and even a scene that looks to be getting reused in Star Wars: Episode VIII. Star Wars: Episode VIII is currently shooting in Dubrovnik, Croatia, with recent set photos showing off a transformed souvenir shop. A piece of concept art shown here for Star Wars 7 hints that this discarded location may getting recycled. It lends credence to the rumor that the Dubrovnik set is actually Maz Kanata's new Cantina. We've also heard that this establishment is located on Han Solo's home world of Corellia. The original art shows this location as part of Maz's original Castle with Han Solo and Rey approaching in the scene. Other interesting artwork included here shows Kylo Ren interigateing a Jedi as Finn watches on in the shadows. We get to see Han Solo's bearded look. And Luke Skywalker has a man-bun! There are plenty of early concept ideas for the Millennium Falcon and the Star Killer Base. And we get to see an early look at a deleted Finn scene that finds the AWOL Stormtrooper hitching a ride out of the hot desert sun of Jakku. In all, there are over 40 images, many of which were featured in The Art of Star Wars: The Force Awakens book that was released in December. Disney Chairman and Chief Executive Officer Robert A. Iger announced earlier this month that Star Wars: The Force Awakens will be available to own early on Digital HD and Disney Movies Anywhere on April 1 before coming to Blu-ray Combo Pack and DVD on April 5. Now you can discover the complete story behind the making of Star Wars: The Force Awakens with in-depth documentary and bonus material that will take fans on an exciting journey behind the scenes. Secrets will be revealed through extensive footage, never-before-seen deleted scenes, and exclusive interviews with the actors and filmmakers. The bonus features kick off with Secrets of The Force Awakens: A Cinematic Journey. For the first time, discover the complete story behind the making of The Force Awakens, revealed through in-depth footage and exclusive interviews with the actors and filmmakers in this feature documentary. The Story Awakens: The Table Read features cast members familiar and new as they reflect on the memorable day they all first came together to read the movie's script. Building BB-8 shows how the filmmakers brought the newest droid to the screen, creating an instant fan favorite in the Star Wars universe. Crafting Creatures allows fans to watch movie magic as the filmmakers bring a cast of new creatures to life. Blueprint of a Battle: The Snow Fight goes deeper into the epic, climactic lightsaber battle between Rey and Kylo Ren. John Williams: The Seventh Symphony features the legendary composer as he shares personal insights of his work on Star Wars: The Force Awakens. ILM: The Visual Magic of The Force gives us an insider's look into the remarkable digital artistry of the movie's visual effects. Force For Change shows how heroes come in all shapes and sizes. See how the Star Wars: Force for Change initiative has united Star Wars fans all over the globe to help others. Fans will also get a number of Deleted Scenes. Digital bonus offerings may vary by retailer. Star Wars: The Force Awakens was directed by J.J. Abrams and written by Lawrence Kasdan & J.J. Abrams and Michael Arndt. Lucasfilm president and eight-time Academy Award nominee Kathleen Kennedy and J.J. Abrams, along with his longtime producing partner Bryan Burk, are the film's producers. Having established a musical legacy with his iconic scores for the previous six films in the Star Wars Saga, acclaimed composer John Williams returned to score Star Wars: The Force Awakens, ultimately garnering his 50th Oscar nomination for it. Take a look at the Blu-ray trailer below for Star Wars: The Force Awakens, along with the official artwork plus the retailer exclusive artwork from Target, Best Buy and Wal-Mart. Take a look at the exciting concept art below.